On the afternoon of January 9, numerous robbers allegedly stormed a Shawnee, Kansas’ “She’s A Pistol” gun store; three were shot and left in critical condition. According to Kansas City’s KCTV 5, the incident took place 2:30 p.m. local time. The male co-owner of the business, his wife, and the other co-owner were all in the business when the robbers came in. The male co-owner was shot and three of the robbers were shot. Of the four total, three were listed in critical condition. Fox News 4 reports that a fifth person–a minor–may have been wounded as well, but the extent of the minor’s injuries were unknown. 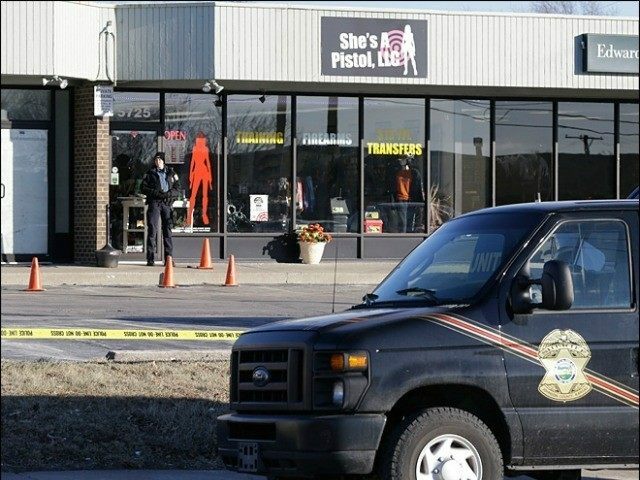 UPDATE: The Kansas City Star reports that four robbers entered “She’s A Pistol” gun store on January 9, while owner John Bieker and his wife Becky were there. When one of the four robbers slapped Becky in the face, Bieker opened fire, wounding three of the four robbers while also receiving a fatal wound. Bieker and two of the robbers were taken to the hospital, where Bieker died. One of suspects is still in critical condition. Two robbers who fled the scene were found hiding in a screened-in porch down the road.